New Hair. Wee new haircut!! Sometimes I get a little scissor happy when I really want to do a certain style. I haven't had a blunt bangs since I was really young (like 10 years old haha), so I thought I'd bring it back for the New Year! 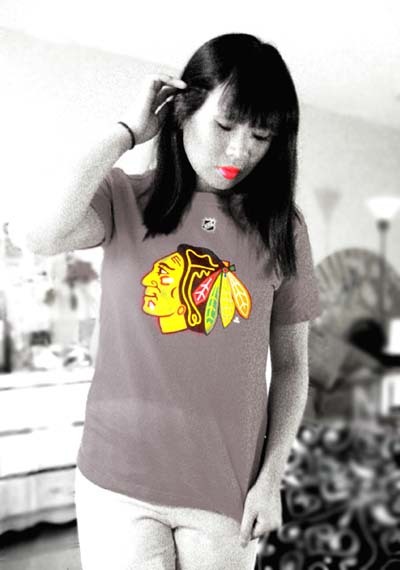 Blackhawks Lovin'. Anyways, it's been a few weeks or so since the NHL lockout ended and by golly, I've never been so happy. So far we're the only undefeated team in the league at 6-0. Woop Woop! Cookie Monster. Although I'm quite happy with my own Chocolate Chip Cookie recipe, I like trying other people's versions every now and then. Unless you burn them or something you can't really go wrong. A lot of people have their favorite recipe or their own version that no matter how similar the ingredients are, just taste different in some way. I recently came across this scrumptious looking cookie video on the interwebs and decided to give it a go. Unfortunately, mine didn't turn out nearly as rustically chewy and amazing as his looked, which I'm not sure why. I did swap out shortening for butter, which I don't normally do..................hmm, okay so that clears things up lol. Butter vs. Shortening. I normally swear by butter, but I've heard other people say the same about shortening. 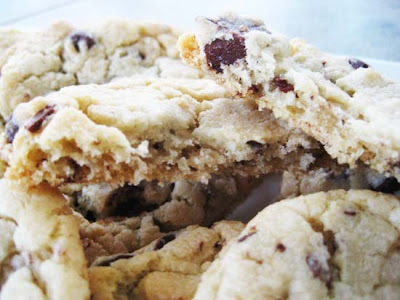 I will say though, I'm in love with the texture that shortening brings, which is chewier and fluffy. 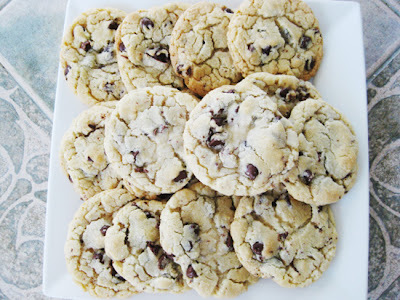 HOWEVER, I'm still missing that overall butter flavor and I quite like the golden brown affect it gives the cookies. As you can see, using shortening creates a more pale, but still slightly golden cookie. Overall, I like this version and will make it again in the future!